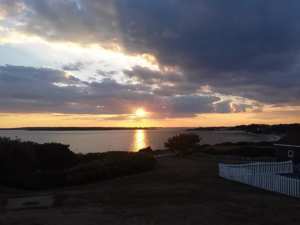 What is the best place to watch sunset in Cape Cod is a question we are asked frequently by our guests. After a day filled with activities ranging from shopping the boutique shops in Falmouth Village to exploring the wonders of Spohr Garden or the acres of walking paths in Beebe woods or biking the scenic 11 mile Shining Sea Bikeway it is time to kick back and relax while watching the sunset in the distance. There are any number of locations to choose from that we are happy to share. Falmouth is surrounded by 68 miles of coastline so as you can imagine there are countless opportunities to stroll any number of Falmouth beaches and stop to watch a beautiful sunset. We are happy to share some suggested sunset locations and will highlight the top two locations in a little more detail as well as a sailing option. One of those spots is Surf Drive Beach which is located just a short mile stroll from The Captain’s Manor Inn and is located on Vineyard Sound. Surf Drive Beach is popular as it is just south of Falmouth Village and its many boutique shops and great restaurants. Surf Drive Beach is a long more narrow beach for strolling and tends to be quieter than some other beach options. Surf Drive Beach faces Vineyard Sound you can watch the Island Queen Ferry and the Steamship Authority ferry as they traverse Vineyard Sound to transport visitors back and forth between Falmouth and Martha’s Vineyard. The beach also features calm waves and rock jetties to explore with the Nobska Lighthouse visible to the East. Another spot to view a spectacular sunset is Old Silver Beach. Of all the Falmouth beaches, Old Silver is the most popular for those seeking a wide and long beach with fine white sand. It is a more active beach due to its popularity with families and children as it is on the Buzzards Bay side and therefore has a bit warmer water (in the 70’s) and very calm wave activity. So now lets talk about the two best places to watch sunset in Falmouth, Cape Cod. It is a toss up on which of these two is the number 1 best sunset location in falmouth as personal preference will determine so we suggest you explore each one of the two during your getaway to Falmouth. Both of the top two place to watch sunset shared below are also two of the most popular locations for couples to get engaged. The Knob is an excellent sunset spot and it is best known for its tranquil setting. The Knob is a top attraction in Falmouth at any time of day as reflected on Tripadvisor. The land was donated as a sanctuary by Cornelia Carey in the 1970’s. We love sharing a map with guests to guide them to this hidden gem near Quissett Harbor. A trail extends from the Harbor to the Knob overlook and is just under a mile in total length. The trail is very easy to navigate and you can expect to experience numerous bird calls as over 100 species of birds have been logged in The Knob area. The remarkable views from atop The Knob include Buzzards Bay, the Elizabeth Islands and sometimes as far as Rhode Island. You do not have to complete the walk to the end of The Knob to experience a beautiful sunset as you can stop once you reach the beach area and just pick a spot to sit down and relax as the sun sets. The other outstanding sunset spot is known for the expanse of ocean you can see with Martha’s Vineyard in the distance during a sunset. This spot is Nobska lighthouse which overlooks Vineyard Sound and the uninhabited Nonamessett Island (the most easterly of the Elizabeth Islands). A wonderful 1 minute youtube video was recently shared on YouTube.The lighthouse is located at the spot near where Buzzards Bay and Vineyard Sound meet in the Woods Hole village of Falmouth, Cape Cod. The lighthouse has been in this spot since being built in 1828. A short drive from The Captain’s Manor Inn, you will arrive at the lighthouse. There is limited parking on site and further down the beach are some other parking options. 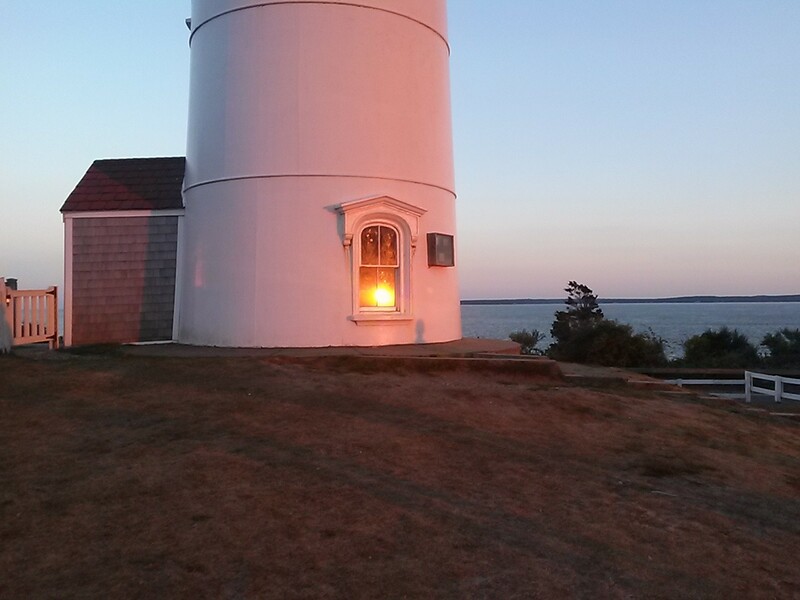 The views from the lighthouse are just spectacular during the day as well as for sunset. Sitting atop a bluff provides a wide angle of viewing for all the sailing kayaking, ferrying etc. that take place on the beautiful Vineyard Sound. When you plan your Cape Cod getaway it will be our pleasure to help you plan to watch a beautiful sunset from land or you may opt for a sunset cruise leaving Falmouth Harbor to sail Vineyard Haven.